As the core of Christianity, the Eternal City is home to a wealth of churches, cathedrals and religious monuments. Let your private English-speaking guide from Italy’s Best show you four of Rome’s most sacred basilicas on your tour of Early Christian Rome. San Giovanni in Laterano, the oldest of Rome’s four papal basilicas and the city’s official cathedral, is our first stop. San Giovanni ranks just above Saint Peter’s Basilica as the most important Roman Catholic Church in the world. A formal papal residence until the Middle Ages, you will find the Papal throne as well as the seat of the Bishop of Rome, both of which are occupied by the Pope. We will have a look into the beautiful Lateran Baptistery, the only baptistery in Rome for many generations. It’s octagonal structure served as the archetype for others built in Italy. On the street opposite the Basilica is one of Christianity’s greatest relics: the Holy Staircase, believed to be the actual stairs from which Christ descended at Pontius Pilatus’ house following his condemnation. According to the legend, St. Helen – mother of Constantine, Rome’s first Christian Emperor–brought the staircase from Jerusalem. Wooden boards now protect the 28 marble steps, and worshippers must ascend them on their knees. The stairs lead to the Sancta Sanctorum, the first private chapel for Popes and the holiest place in the world. The chapel, complete with stunning Cosmatesque pavement, displays an unusual wood painting of Christ titled Acheiropoieton (“made without hands’), believed to have been painted by Saint Luke and an angel. We will then move on to the Basilica di Santa Maria Maggiore, which reigns as an authentic jewel in the crown of Roman churches. Its legendary treasures are of inestimable value, and represent the Church’s role as the cradle of Christian artistic civilization in Rome. For nearly sixteen centuries, Santa Maria Maggiore has held its position as the world’s foremost Marian shrine and a magnet for pilgrims, many of who have travelled to the Eternal City to experience the basilica’s beauty, grandeur and holiness. Our last stop on our tour of Early Christian Rome will be the Basilica of St. Paul, dedicated to one Rome’s two patron saints. The basilica, which sits outside the Aurelian Walls, was founded by Constantine and built above the St. Paul’s burial place. 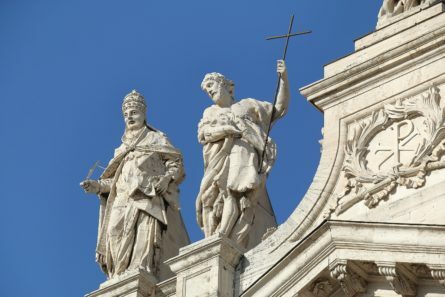 Should you be interested in visiting St Peter's, the fourth major basilica in Rome, contact us and we will be happy to incorporate it into your itinerary.